Another New York Fashion Week has come and gone. This year, I followed along via social media and corals + cognacs hilarious behind the scenes recaps. On the runway, I had some clear favorites- classic icons like Oscar de la Renta and DKNY and newer brands: Mara Hoffman, Clover Canyon and more. There were definitely some clear trends for Spring 2014 like the crop tops, pastels, and your expected "Spring" items. I'm sharing with you some of my top picks from this year and my favorite trends. 1: Ever so classic white is re-invented again by Oscar and Tory. Both of these looks are drop dead gorgeous. Can we just talk about the ODLR dress and that Tory Burch jacket!? 2: Romantic is a revolving trend that seems to come up quite often and here it is again. 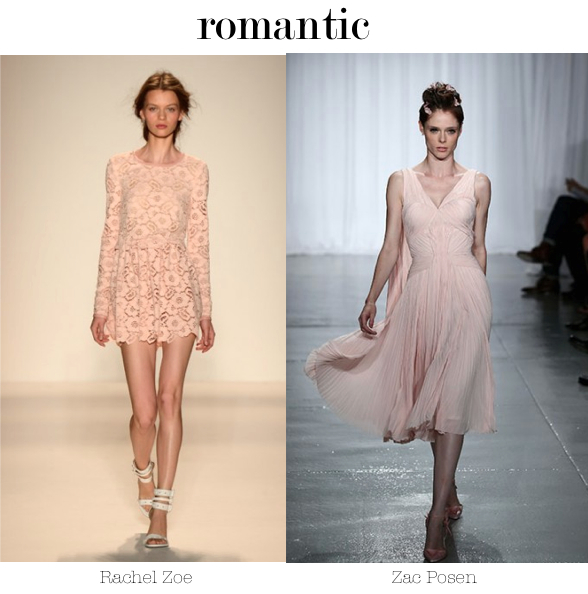 Zac Posen and Rachel Zoe both show romantic styles this year with lace, silk, and soft blush tones. 3: For spring, bold and graphic prints are back. 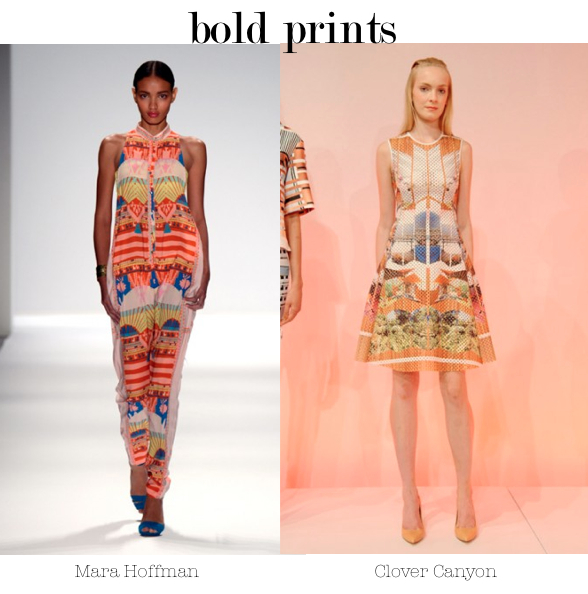 Print masters, Clover Canyon showed some stunning prints for the upcoming season- like the dress above! Mara Hoffman, who also knows how to rock prints, sent bold maxis down the runway. 4: Sporty-Chic is one of my fave trends. (see my post on baseball hats) DKNY showed her signature colorful sporty chic look with an extra bit of the cool factor- look at this showstopping dress! Milly was one of my favorite shows. I love all the mesh details but it still looks put together and fresh. I would love to know what your favorite show from NYFW was or what you thought of this season- please share with me! i love that zac posen dress! so pretty! Thanks for the mention, Sloane. ODLR and Clover Canyon were two of my favorites this season, too! Thanks for stopping by Hallie! Your NYFW posts were great! Great post! I love the name of you blog and I just love your blog! Aren't they great! Thanks for stopping by Olivia. That's so interesting because when I hear Rachel Zoe, I think 70s flower child or mod chic.. not necessarily romantic but I love that she is so versatile. Really great round up! !